When we hear the word freedom, we usually define it as the absence of restriction beyond the reach of oppression, judgment or inhibition. But we could also view freedom as a positive moving toward life and a search to connect out of free will. 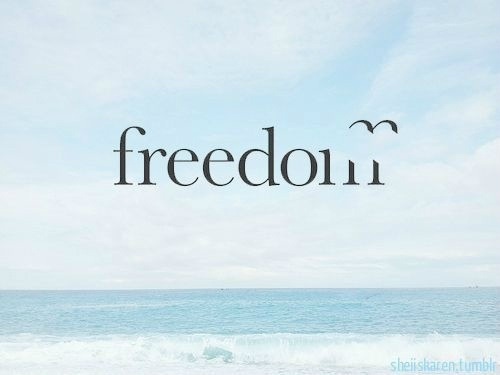 In fact, the freedom to do and to feel, to love, to experience, to fulfill our potential...that is TRUE freedom. Typically, the call for freedom in a relationship confuses it with autonomy, with having "my own space." Yet a healthy relationship requires mutual autonomy, allowing both voices to be heard and authentic selves to grow without either trying to manipulate the other or impose a given outcome. So what seems like an agitated demand for relationship freedom might actually be a desire to escape frightening confrontation. It may be a coping mechanism learned in childhood, often through time-outs, the forced isolation of children to resolve their issues alone which, of course, they cannot possibly do. Discuss a different way to talk to one another that works for the both of you. When such neglectful emotional exile is what we live and learn, we may develop a compulsive need for freedom from people, leading to love avoidance in relationships when we are adults. This type of enslavement to deadening, detrimental withdrawal patterns out of fear of intimacy is the very opposite of freedom. We attain the freedom to relate with unconditional love by acknowledging and addressing personal issues, and by building our relationships on trust and trustworthiness. Valuing ourselves and others empowers us with the freedom to care deeply without fear of rejection and disappointment. The freedom to forgive, perhaps the hardest freedom to capture, consecrates our own impure impulses, permitting the light of awareness to illuminate them and to let us work them out. In these ways, freedom to feel and to act frees us from our habitual self, and frees us to become our best self.